ACES was founded in 2014 by a generous donation from Drs. Miriam and David Donoho to enhance the educational mission of Stony Brook School of Medicine. 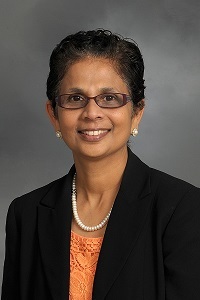 ACES Founding Director, Latha Chandran, MD, MPH, is a national leader in faculty development and educational scholarship. She was the first educator to be tenured as a full professor in the Educator Scholar Track. Membership in the Academy of Clinical and Medical Educators signifies outstanding contributions to the educational mission of the School of Medicine. Members are selected through a competitive application process​ based on their accomplishments in one or more aspects of medical education. Those accepted into ACES will receive one-on-one mentorship from a Senior ACES member to carry out a medical education scholarly project. All ACES members will continue to be active participants in medical education, as well as faculty development sessions, workshops and our Annual Medical Education Day in April. It is our expectation that ACES members will be identified by faculty and students as leaders in medical education. Nine inaugural members of ACES were chosen from 19 faculty members who applied for membership in March 2014 after having successfully competed for a Curriculum Alignment Intramural Grant. These ACES members created the Stony Brook Teaching Families (SBTF); five simulated families that have been incorporated into the medical school curriculum to provide clinical and psychosocial context of patient care in the preclinical years. Creation of a community of dedicated and scholarly educators whose creativity and innovation will address important issues in medical education for the physicians of tomorrow. The mission of ACES is to develop and promote expetise in medical teaching, educational scholarship, and leadership among the SoM faculty.